The National Chairman of the All Progressives Congress, APC, Comrade Adams Oshiomhole in this interview responds to issues arising from the crisis in his party and the National Assembly, saying that Senate President Bukola Saraki has done everything to frustrate the pRESIDENT Muhammadu Buhari administration to the purpose of ensuring that the president is not re-elected. Are you worried about the defections of a couple of governors from your party? No. I am concerned that some of them had to leave and I had conversation with some of them. But the truth is that there are categories of grievances. Some grievances are negotiable, you can discuss them, and it can be resolved. But if you have certain expectation or certain ambition, it is difficult to negotiate that ambition. Ambition is non-negotiable. I have my respect for Governor Aminu Tambuwal, he knows my views about the actions he has taken, and I will leave it at that. What is your response to the issues raised by Senate President Bukola Saraki against your party? Without going back to ancient history, suffice to start by looking at how in the first instance, Senator Bukola Saraki became the President of the Senate. He decided, clearly against the party's position to enter into a deal with the opposition PDP and got a faction of the PDP and taking advantage of the provisions in the Constitution to side with him while the majority of the APC senators were having a meeting at the International Conference Centre in order to resolve the issue of leadership of the Senate and other principal officers of the Senate that were expected to be produced by the ruling party with majority senators in the Senate. Because he had put his interest over and above the interest of the party, he went into alliance with the PDP, and he conceded the position of Deputy Senate President to the opposition to obtain the support of the opposition for him, Senator Saraki, to become the Senate President. This action alone portrays Senator Saraki for who he is; his interest comes before any other interest, including the national interest and the interest of his political party. Having gone into this unholy alliance with the opposition and mortgaged the right of the ruling party, he proceeded to appoint opposition senators to head strategic committees whose activities can affect either for good or for bad, the workings of the government and relationship between the government and the legislature by trading away sensitive and strategic committees to the opposition. Senator Saraki did that to continue to protect himself against the wish of his party as Senate President. Again, that shows that the only thing that was always constant in the mind of Senator Saraki was how to cling on to power even if it means at the expense of his party or even of the country, and I will speak on that. The Senate under Saraki chose instead to delay the budget up to the end of the first half of the year, to coincide with the period of the rainy season such that those aspects of infrastructure such as roads, for example, cannot be constructed during rainy season. These were not errors of the head on the part of Senator Saraki's leadership. They were designed to frustrate the capacity of President Buhari's government to address physical infrastructural deficit without which the ordinary man in the street cannot feel the impact of governance. On receipt of the budget by Mr. President, after going through it, Mr. President cried out, that the budget that was handed over to him by the National Assembly under the leadership of the Senate President, was a clear distortion of the well thought out budget proposal that was submitted to the National Assembly. Whereas Mr. President appreciates that the National Assembly could make some alterations in the budget, he did not expect that the budget will be completely re-written and so grossly distorted as to make far more provisions for recurrent expenditure such that there is very little left for capital project without which the Nigerian people cannot benefit from governance. And, the President said this budget will be difficult to implement. You have all heard the stories of budget padding and no budget padding, but on this occasion, I rather not delve into those. So, when I say that the Senate President has never put Nigeria first, I support this statement by the deliberate delay of the budget and the deliberate manipulation of provisions in the budget in a way that it will compromise the commitment of the government to address critical infrastructure. It is by now not a secret that as Senate President, he conspired with others to try to create a sense of division within the ruling party, having failed to truncate the convention, where they assembled a couple of people who were neither delegates nor contestants for any of the offices at the convention to purport to have formed a political party. There is nothing for me to add to the illegality of this action and the false foundation that the Senate President tried to lay. I rather submit totally to the illuminating submission of Mr. Femi Falana, SAN. He has spoken extensively on the illegality of Senator Saraki's action. Whether in terms of purporting that there is a faction in a political party or basing his decision to encourage defection on the basis of his imagined faction in his party that is unknown to law. Again, that did not portray him as someone who is concerned about sustaining democracy; because sustaining democracy also requires total submission to the rule of law. Upon his illegal defection, which he did hurriedly because the number of senators who he was playing on their fears that they will not be able to return to the Senate or that if they return they will be heading to prison, if President Buhari is re-elected. He had about 36 senators who were on his list to defect, but consequent upon our election and our assumption of office, we took pre-emptive step to reassure those senators. A day after the convention, Sunday 24th June 2018, the first person we met was Senator Bukola Saraki, to try to listen to whatever his grievances were and this I did in company of the Vice- President. However, his real grievances were not negotiable; which were about ambition, about values, and conflicting values of him as a person and the values of the APC. However, when he defected, however illegal his action was, he went to Ilorin to tell Ilorin people part of the truth, when he said that among other things that he was leaving for two major reasons. Number one was that he alleged that President Muhammadu Buhari gave out over 200 juicy jobs without allocating some juicy jobs to him. And, he chose to speak for the Speaker of the House of Representatives, Rt. Hon. Yakubu Dogara that even Dogara also was not given juicy positions. That is aside the key issue which was that he was not given a share of the so-called 200 juicy positions. I asked, giving Senator Bukola Saraki, Senate President juicy position, does that coincide with Nigeria's public interest? The second reason he gave was that he was being persecuted. Again, even that, the alleged persecution of his person, not persecution of his people. Again, he never pretended that any of these actions had to do with the good people of Nigeria, they had to do with his person, to the extent that he alleged personal persecution of his person, not that of Kwara State people, or the people of his constituency or Nigerians. But, I think the Governor of Kwara State, Alhaji Abdulfatar Ahmed was more explicit in corroborating Senator Saraki's claim when he said that he, as a governor and Senator Saraki as Senate President, were being linked to armed robbery cases as part of their reason for defecting. Again, nothing to do with the Nigerian project, nothing to do with Kwara State people. Do you believe Saraki was involved? You know that when armed robbery suspects, in this case, it was armed robbery and mass murder, if he was linked to armed robbery, that cannot be an offence caused by the All Progressives Congress or of the government. And, he has not denied he does not know those people. 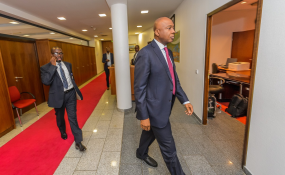 Then lastly, in support of my thesis that the Senate President, Bukola Saraki has never acted with Nigeria's interest in view, my final submission is the way in which he adjourned the Senate about two weeks ago. The Senate calendar is not a secret to the presiding officer of the Senate. The Senate calendar that was known was that the Senate was going to adjourn on a Thursday. By Tuesday morning or Monday night, Senator Saraki used his guest house, wrote out names of senators with provisions meant for signatories, for senators to decamp to the PDP from the APC. Happily, some of the senators present refused to sign. And that was what frustrated his calculation that by the time he was done, he was going to turn APC into a minority party in the Senate. For careful observers, was it a coincidence that as the Senate President was reading defections, his counterpart in the House of Representatives was also reading the names of members who defected? So, there was a coordination for defection day. But happily, the pre-emptive steps we have taken to address those with genuine grievances frustrated their number such that from 36, he could not get more than 14 senators to decamp. This was on a Tuesday, the calendar of the Senate stated that they were going to adjourn on Thursday. So, between Tuesday, Wednesday and Thursday, the Senate was expected, like I confirmed from the Senate Leader, they were expected among other things, to look into the supplementary budget for INEC. And, realising that INEC requirements are not equipment you buy from the shelf, you must order them and make allowance for the manufacturers to produce them. You don't buy them the way you buy a pack of cigarette from the shelf. So, time is of the essence. However, the Senate under Saraki's directive adjourned without considering the matter that was before it including the budget for INEC. Now, if Senator Saraki adjourned the Senate ahead of schedule to resume towards the end of party nominations, can that act be said to coincide with the national interest? If you decide to frustrate the INEC by denying it the funding that it requires, can you be said to be a defender of democracy? Everything and anything that the Senate President had done, has never been informed by the national interest as we understand it. All the allegations about the lack of transparency and the emolument of the Senate are taking place under his watch. I am sure you have all known how people have interrogated how much they earn, you have an arm that is completely unaccountable. That is the way the Senate President has presided. And, I submit that these actions did not coincide with national interest. Therefore, his attempt to use the incident at the National Assembly to portray himself as the conscience of the nation is to insult our collective intelligence as a people, and I felt that he should not be allowed to get away with that distortion. Of course, if he does not resign as Senate President, he will be impeached according to law. Not by thuggery or anything that is undemocratic. He cannot sustain a minority rule in the Senate, and that is what is hurting him as we speak. They have about 48 senators; we have 53 senators. So, how can 48 senators preside over 53 senators? He is returning us to the PDP era that 16 governors were more than 19 governors. That is the era Saraki is taking us to, and incidentally, he belongs to that club and to that club he has returned. So, we can see directly where he is going; he cannot change his colour at old age. If he thinks that by doing that he is going to pre-empt the APC from having him impeached, he is deceiving himself. I think Saraki's time is over. The way he has manipulated the politics of Kwara State, he fails to understand that the Nigerian national project is far more complicated and it is not at his mercy or the mercy of his dynasty. So, he will not only be impeached; we will work hard to have him defeated as a senator in his senatorial zone in 2019 by the people of Kwara State, who are fed up with Saraki and who are fed up with Bukola. What is your take on the allegation by the Senate President that the present administration of President Buhari has a government within the government? The person who alleges has the burden of proof. It's for him to prove it. You don't ask me to prove allegation made by another person. And, because he is number three citizen, what he says, he ought to explain it transparently, that is honour, that is character. Those are obligations that are associated with you when you have to occupy that office and make that kind of statement. From what you said, are you saying that the APC has also lost confidence in the Speaker of the House of Representatives, Yakubu Dogara, even though he has not announced his defection? No, I have absolute confidence in Rt. Hon. Yakubu Dogara. I said something earlier, I said, it was Senator Saraki, he did not only complain he was not given juicy appointment, but that Rt. Hon. Dogara was also not given. And, I wondered aloud, whether Saraki thought that Dogara was not capable of speaking for himself, after all, he is the Speaker. So, if those were the views of Rt. Hon. Dogara, it was not for Saraki to parrot. Hon. Dogara is capable any day of speaking for himself. The point I tried to make is that Saraki wants to drag everybody along with him. The All Progressives Congress (APC) as a party and myself as chairman, we have confidence in Hon. Dogara. I have had very, very useful conversation with him, we have had couple of meetings, he has shared with me in trust, his concerns that have to do with issues in Bauchi State, and I have taken steps to address those issues to the best of my ability. And, I have shared with him that I am excited that we are getting very positive results. So, Hon. Dogara has no problem with the APC. And, he did not do anything similar to what Senator Saraki did. He emerged as Speaker, and he also ensured as a patriot that an APC member emerged as Deputy Speaker. He was not so desperate to mortgage that position to PDP to cling on as Speaker. He knew the difference between personal interest and party interest.